Fredericks was proud of his Danish-Norwegian heritage and created a medal for the Rebild National Park Society in Jutland, Denmark to honor friendship between the United States and Denmark. The Rebild National Park was purchased by Danish-born Americans to be a site for annual reunions and deeded to the Danish government in 1912. This crest mold is one section of the medallion "face." The mold is in poor condition as damage and cracks are visible and clay fills in some missing areas. Sisal, a strong plant fiber, has been mixed with the plaster and applied over the iron rods for strength and reinforcement. The plaster surface is discolored by shellac which is used as a releasing agent. The symbolism of the crest is three lions which represent the arms for Denmark; 9 hearts which are often described as water-lily leaves and a crown at the top. An image of the complete medallion is pictured in Marshall M. Fredericks, Sculptor on page 223. 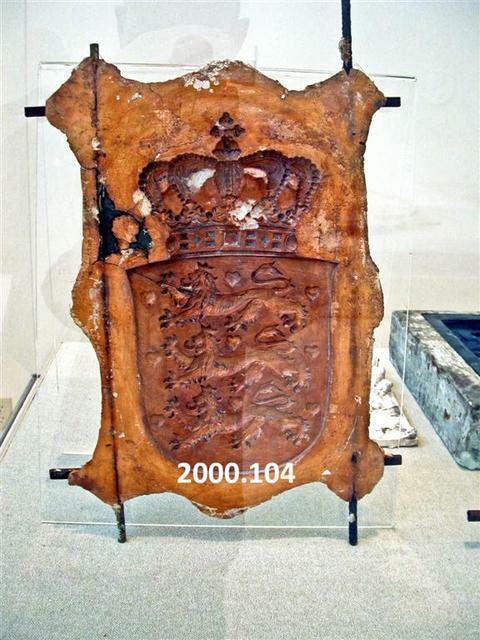 Fredericks, Marshall M., 1908-1998, “Rebild National Park Society, Danish Crest, Mold, [Plaster],” Marshall M. Fredericks Sculpture Museum, accessed April 22, 2019, http://omeka.svsu.edu/items/show/5672.